Mt. 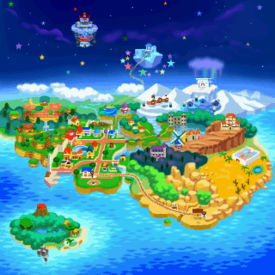 Rugged is a rugged, rocky mountain in the southeast of the Mushroom Kingdom in Paper Mario. The foot of the mountain can be accessed from Toad Town via the K64 train. In Chapter 2, Mario and his partners must climb the mountain in order to get to their destination behind the mountain, Dry Dry Desert. Mt. Rugged is where the player meets Parakarry, a Paratroopa who tells them that he has lost letters all over the Mushroom Kingdom; several on Mt. Rugged. The player must first locate Parakarry's three letters on Mt. Rugged, once the player has achieved this, Parakarry will join the party. Mario needs Parakarry to hover across a broken bridge on the mountain as well as getting the Magical Seed here. Buzzar is also encountered here and the player has the choice of battling him, which can help get him Star Points; alternately, he can tell Buzzar that he is Luigi, and Buzzar will surprisingly leave him alone. Mt. Rugged is where Whacka can be found. When Whacka is hit with Mario's Hammer, an item appears from his head called Whacka's Bump. Eight of these can be gotten until Whacka disappears. There is a Toad girl who is a Whacka lover near the train station. When Mario talks to her, she expresses her adoration of the Whacka, and after the Whacka's disappearance, her worry about where it could have gone. A Super Block can also be found in the area near the train station, but blocked by a Stone Block, it is accessible only after getting the Super Hammer from Dry Dry Ruins. The in-game map description reads, "It's a very rugged, rocky mountain. Dry Dry Railroad's Mt. Rugged Station is here. Dry Dry Desert is on the other side of Mt. Rugged." For enemy formations in Mt. Rugged, see here. Star Piece Under a hidden panel in the corner the slope leads to in the third scene. On a ledge in the fourth scene. In the southwestern corner of the room to the north of the second room (requires Parakarry). Letter On a big stone in the third scene (requires Kooper). Down the cliff in the fifth scene. In the room to the north of the second room, accessible after sliding the slope. Magical Seed Given by the Bub-ulb (requires Parakarry). Egg In a bush near the Dry Dry Railroad station (may be obtained repeatedly by reloading the area). Whacka Bump Dropped by hitting Whacka. Sleepy Sheep In a question block at the southeastern corner of the second scene. Mushroom In a question block at the scene to the north of the second room. Honey Syrup In a question block at the scene to the north of the second room. Quake Hammer On a big stone in the third scene (requires Parakarry). Damage Dodge In the scene to the north of the second room, by going in the cave for a chest box. This is the Mt. Rugged station on the Dry Dry Railroad line. Not much grows around here or on the barren mountain. Watch out for the sneaky Monty Moles that are common to this area. They're dirty fighters. They pop up from underground and chuck rocks at people. The cowards! Phew! Maybe we ought to take a break! I didn't realize the road up would be so rough! Of course, as nice as it would be to take five on a rock, you have to watch yourself. Enemies disguise themselves as rocks. They're nasty and spiky, so keep your eyes open. Whoa! We're pretty high up! Ooog... I feel a little faint. I never told you this before, but I have a fear of heights. Mario and Bombette meets Parakarry on Mt. Rugged. Parakarry Sky Diving a Monty Mole. Buzzar looking at Mario and Parakarry. A Star Piece on Mt. Rugged. Another Star Piece on Mt. Rugged. The Super Block on Mt. Rugged. Gotsugotsu Yama Craggy Mountain. The Toad worker at the Mt. Rugged station in the Japanese version of Paper Mario refers to it as ゴツゴツやま, indicating that the kanji 山 should follow its kun-reading, やま. This page was last edited on January 9, 2019, at 08:11.